6 Impaktor bits, 50 mm long, 1/4'' hexagon drive, suitable for DIN 3126-F 6.3, ISO 1173 bit holders or for direct insertion in the power tool. 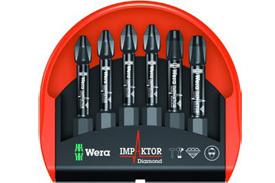 The Impaktor technology ensures an above-average service life even under extreme conditions. The rough diamond coating of the bits reduces the danger of any slipping out of the screw head due to the enhanced frictional resistance. Mini-Checks are thinner than the thickest tool they contain so they can even be carried in a shirt pocket. Bits are arranged according to drive and size for rapid bit selection. The plastic materials used are very robust and ensure long service life.